For over half a century, American cities were decentralizing, with suburban areas surpassing city centers in both population and job growth. It appears that these economic and demographic tides are now changing. Over the past few years, urban populations in America’s cities have grown faster than outlying areas, and our research shows that jobs are coming with them. Our analysis of census data shows that downtown employment centers of the nation’s largest metropolitan areas are recording faster job growth than areas located further from the city center. When we compared the aggregate economic performance of urban cores to the surrounding metro periphery over the four years from 2007 to 2011, we found that city centers—which we define as the area within 3 miles of the center of each region’s central business district—grew jobs at a 0.5 percent annual rate. Over the same period, employment in the surrounding peripheral portion of metropolitan areas declined 0.1 percent per year. When it comes to job growth, city centers are out-performing the surrounding areas in 21 of the 41 metropolitan areas we examined. This “center-led” growth represents the reversal of a historic trend of job de-centralization that has persisted for the past half century. As recently as 2002-2007, peripheral areas were growing much faster (1.2 percent annually) and aggregate job growth was stagnant in urban cores (0.1 percent). While the shift of metropolitan job growth toward services is aiding job centralization, the strong central growth of 2007-11 appears to be driven by the growing competitiveness of central cities relative to peripheral locations. Our analysis shows that city centers had unusually strong job growth relative to peripheral locations in the wake of the Great Recession. Some of the impetus for central city growth comes from the relatively stronger performance of industries that tend to be more centralized, such as finance, entertainment, restaurants, and professional services. The story is not just that job growth in central cities is improving when compared to outlying areas – city centers have also erased their competitive disadvantage relative to peripheral locations. The strength of city centers appears to be driven by a combination of the growing attractiveness of urban living, and the relatively stronger performance of urban-centered industries (business and professional services, software) relative to decentralized industries (construction, manufacturing) in this economic cycle. 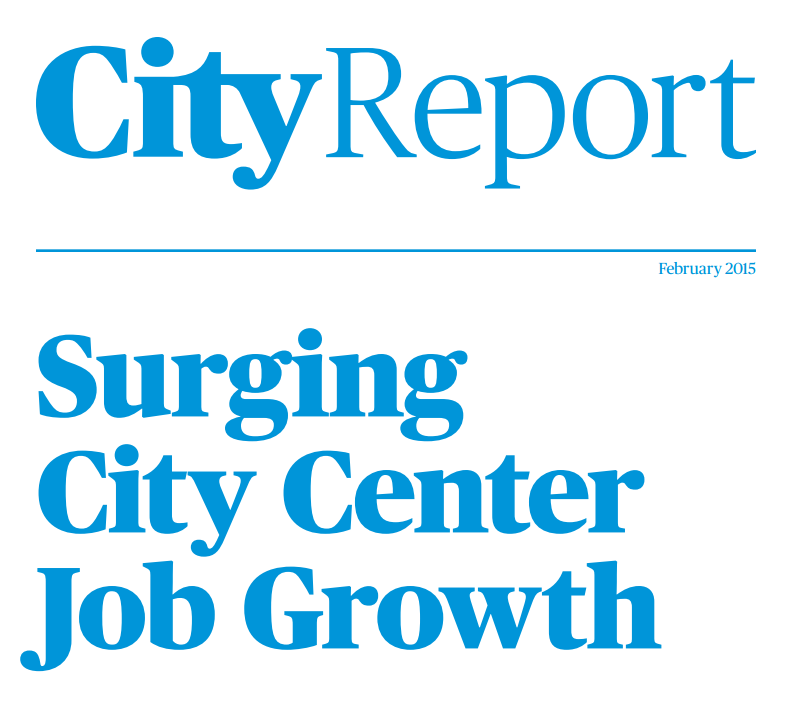 While it remains to be seen whether these same patterns continue to hold as the recovery progresses, (the latest LEHD data on city center job growth are for calendar year 2011), there are structural forces that suggest the trend of center-led growth will continue. To hear a podcast on the report and its ramifications, go here. Download the full report on this page to learn more about this shift and read our complete analysis.